Ayman al-Zawahiri, the Egyptian doctor who replaced Osama bin Laden as the head of al Qaeda four years ago, in a new audio message accused ISIS top leader Abu Bakr al-Baghdadi of “sedition” and insisted the Iraqi terrorist recluse was not the leader of all Muslims and militant jihad as “caliph” of the Islamic State, as al-Baghdadi had claimed 14 months ago in a Mosul mosque. Had ISIS and al Qaeda realigned by joining forces, it “would be terrible,” said Olsen, an ABC News contributor. That division -- now formally declared by the highest ranking official of the group that slaughtered almost 3,000 Americans 14 years ago in multi-pronged aviation attacks -- could provide an opening that American counter-terrorism operatives could find a way to exploit, he added. Olsen said the U.S. could use misinformation to further pit the two jihadi menaces against each other and encourage the series of gunfights and assassinations each has waged against the other -- like when ISIS reportedly killed a top Zawahiri emissary trying to broker a ceasefire between the fighters in Syria in February 2014. The fledgling franchise in Afghanistan and Pakistan, known as IS Khorasan Province, “has been fighting non-stop” with the Taliban and al Qaeda there, a counter-terrorism official told ABC News. “Fighting each other makes our job easier,” said the official in Afghanistan. 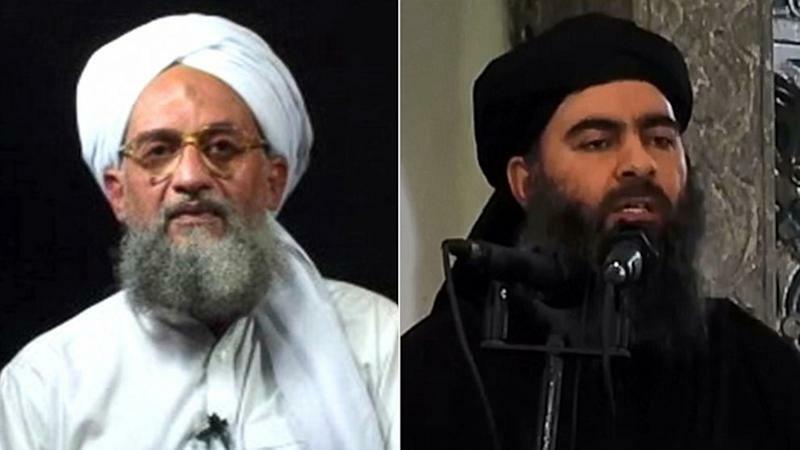 In the new audio tape, which was released online Wednesday and accompanied by a still image or al-Zawahiri and text of his speech, the al Qaeda leader appeared to confirm that he had not directly addressed infighting among the jihadis of ISIS and al Qaeda’s Syrian wing, Jabhat al-Nusra or the al Nusra Front, for fear of legitimizing ISIS. ISIS, formerly the al Qaeda branch in Iraq, split from the larger group two years ago. In the tape, al-Zawahiri complained that Baghdadi had ignored Muslims suffering in Gaza and in Pakistan. Al-Zawahiri's sour grapes speech, however, appeared to have been recorded last spring, analysts said, and reiterated past pledges of loyalty to Taliban leader Mullah Omar, who recently was confirmed dead by the Taliban. That appeared to mark a rare misstep for al Qaeda and al-Zawahiri, who once was able to leak his videotaped response to news events as quickly as one week later, but who now is in hiding with a $25 million U.S. bounty on his head. Nicholas Palarino, a recently retired senior congressional counter-terrorism adviser who teaches about terrorism at Georgetown University, said al-Zawahiri being forced to call out al-Baghdadi weakens the power of both al Qaeda and ISIS and may offer Arab governments a window of opportunity to drive a wedge between the jihadi groups and those who are flocking to fight in Syria and Iraq. “Moderate Muslims need to exploit this rift. The leaders of Jordan, Kuwait, Saudi Arabia and Egypt can explain the differences between these two groups to the world’s Muslims,” Palarino said. Though it didn't foresee the rise of ISIS, former CIA Director Michael Hayden said the intelligence community had predicted a rift in al Qaeda emerging after bin Laden's death -- something like what's happening now between ISIS and al Qaeda, which the U.S. could use to its advantage. "It would be a good idea to do so. We always thought that the death of bin Laden could create a rift between the Egyptians and the other Arabs inside al Qaeda since Zawahiri was an Egyptian. Seems to have played out," former CIA Director Michael Hayden told ABC News. When it comes to exploiting the rift between two deadly extremist groups, however, Hayden cautioned, "You need to be careful."